The New Hyde Park Board of Trustees is sworn in by Mayor Lawrence J. Montreuil. 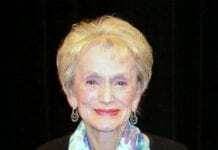 All incumbents ran unopposed and were re-elected to their posts. Photo credit: Maylan Studart. 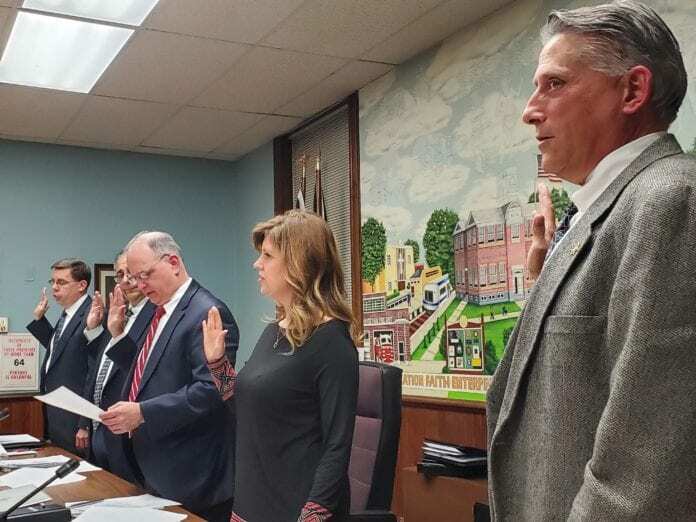 The New Hyde Park Board of Trustees discussed a tentative 2019-20 budget that would raise taxes by 2.6 percent and swore in new village appointees and officials Tuesday night. The proposed budget totals $6.5 million, an increase of $36,000 from the current level. The tax levy would rise by $117,200 to $4.5 million, which would raise individual local tax bills by $39.96 per year. The tax rise is the maximum allowed under the state tax cap. Mayor Lawrence Montreuil said taxes rose because the village lost revenue from state aid and property assessments decreased. The total village assessment roll as of Tuesday was $19.6 million, a decrease of $124,000. The mayor also said the increase in taxes was necessary because the board “tried cutting costs” but “couldn’t find” any other expenses to cut from. The 2.6 percent tax levy rise for the 2019-20 budget comes after a 2.21 percent tax levy rise in 2018-19 and a rise of 1.59 percent in the 2017-18 budget. In all, that’s an increase of nearly $300,000 in additional taxes to residents in the last three years or an average of $83.70 per household in the same period. The largest expenses in the budget are employee benefits of $1.6 million, home and community services of $1.2 million, transportation personnel salaries and expenses of $1.08 million, $620,000 in organizational staff expenses, special items like tax grievances judgments of $382,000 and public safety expenses of $416,000. The largest revenue items are property taxes of $4.5 million, transportation revenue from fees and fines projected at $587,000 and other fines of $422,500. The village lost state aid and grants due to Gov. Andrew Cuomo’s 2019-20 budget, which left one of the eight residents present for the meeting feeling resigned. “Can we have the governor’s raise sent back here and undo the tax increase?” the man said jokingly. CHIPS, or the Consolidated Local Street and Highway Improvement Program, income from the state was calculated separately from the budget and is expected to come in at $119,400. Bond payments for the 2019-20 fiscal year are expected to be $463,550, about $11,000 lower than the previous year. The Village of New Hyde Park had 98 people on its payroll in the previous budget, which is expected to rise to 103 in the 2019-20 proposed budget and cost taxpayers $2.4 million. That is a rise of $176,000. New Hyde Park Village Clerk and Treasurer Cathryn Hillmann presented the budget to the board, which decided not to approve it until the next meeting on Thursday, April 18, to allow for further deliberations and public comments. In the organizational meeting, Trustee Donna Squicciarino was sworn in as deputy mayor along with Trustees Richard Coppola, Richard Pallisco and Rainer Burger, all of whom were re-elected to their posts after uncontested elections last month. 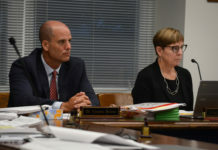 In other action, the Board of Trustees passed a resolution to change its bimonthly meeting dates from Tuesdays to Thursdays, beginning April 18. “We know it’s a big departure from tradition, but we’re going to give it a try this year,” said the mayor. All other agenda items like payments, conference attendance, mileage reimbursements and a new procurement policy were approved unanimously. During the Q&A session, the few residents present showed concern about construction going on around Covert Avenue and New Hyde Park Road due to the Long Island Rail Road Expansion Project ramping up. Burger provided an update stating that April 15 will be a big day for the area. That is when a building on 115 New Hyde Park Road will be demolished and Covert Avenue will close for six months to allow for digging to create the elevated railroad crossing for the third track project. 3rd Track Constructors, which is spearheading the LIRR expansion, will host a public information session to provide updates and listen to residents on Wednesday, April 3, at 7 p.m. at the New Hyde Park Marcus Christ Community Center on 1420 Jericho Turnpike. Previous articleColumn: Should you build a new home, larger one or renovate my current place?